Broxburn boss Max Christie hailed the best performance he’d ever seen from his team as they beat Bo’ness 3-0 to reach the final of the Fife & Lothians Cup. 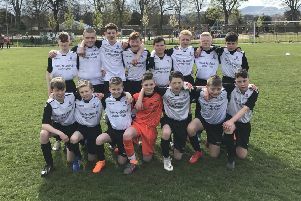 Christie’s men claimed a deserved win at Newtown Park and will now meet Premier League shocktroops Tranent in the final on Wednesday, June 7 at New Victoria Park, Newtongrange. Bo’ness started strongly but were soon left reeling by a strange decision by referee Colin Whyte. Roddy MacLennan was sent sprawling by goalkeeper Connor Wallace but, with the ball landing in the net, everyone expected advantage to be played and a goal awarded. Astonishingly, the official blew for a penalty instead. Up stepped Marty Wright, but keeper Wallace produced a great save – much to Bo’ness boss Alan McGonigal’s disgust. Broxburn then stepped up the pace and scored when Darren Cole lashed the ball home in the 25th minute. Then, just before the break, Bo’ness full back Michael Gemmell was sent off for a second booking leaving the home side with a real uphill struggle. After the break, Broxburn again stepped up a gear and, in the 63rd minute, added a second when Kieran Anderson raced onto a long ball, rounded the goalkeeper and, from an acute angle, stroked the ball home. Broxburn were flying now and a third goal was always on the cards. It came with seven minutes remaining when Zander Miller slammed home following a great run down the right wing by Nicky Locke. Broxburn were sharper and quicker to the ball and looked up for this game once Bo’ness had spent themselves in the opening 20 minutes. The penalty decision was bizarre, though, and had the goal stood, the result could have been different. Bo’ness boss McGonigal was honest in his assessment. Bo’ness: Murphy, Gemmell, Simpson, Campbell, Hunter, Ru MacLennan, Ro MacLennan, Philp, Keast, Sloan, Wright. Subs: Gibb, Scullion, Smith, Tierney, Ritchie. Broxburn: Wallace, Cole, Baptie, Gavin, Purves, Linton, Gribben, Scott, Miller, Locke, Anderson. Subs: Brown, Richardson, McNaughton, Miller, Donaghue.